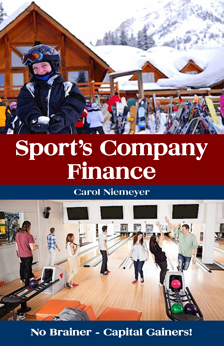 “Sport’s Company Finance” is a book that will provide readers with information on how to develop, finance, and manage a sport’s company. 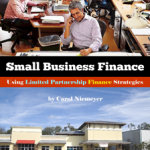 “Sport’s Company Finance” covers these concepts: sponsorships, partnerships, limited partnerships, business debt, business equity, incorporating, financial reports, city bonds, business lease agreements, business real estate issues, business mortgages, business credit cards, company automobiles, equipment leasing, business insurance, business ownership perks – and more! Also, “Sport’s Company Finance” encourages sport's company owners to build their own company facilities. “Sport’s Company Finance” also provides readers with multiple, sport company, mini-business plans, examining sport companies like: water parks, ski resorts, bicycle shops, 4-wheeler parks, golf course home developments, motorcycle parks, sports plexes, tennis centers, sporting goods stores, baseball academies, sports camps, amphitheaters, driving ranges, summer retreats, and more! “Sport’s Company Finance” focuses on companies that earn between $2.5 – $75 million a year!! – big money-makers – millions a year! – capital gainers – they produce a big capital gain on the sell of their entity or property! Let me say that again. Sport's companies just make money!!!! That's right. They produce great cash-flow, just like apartments, shopping centers, and office-warehouses. And that's what limited partners are interested in – cash-flow – the companies monthly net profit! 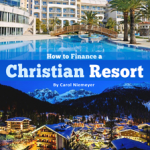 So, buy and read “Sport’s Company Finance”; and find out how to create your own successful, multi-million dollar, sports business company, today! It’s easy. So don’t delay! You’re a WINNER! So, get in the money game, today!